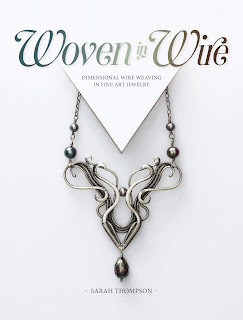 Did you read Sarah Thompson's first wire book, Fine Art Wire Weaving? If so, then you'll be completely thrilled to see that she has a second, more advanced book out: Woven in Wire. May I just say...Oh. My. Gosh! Sarah is a master, and she is a true artist. These are challenging projects that are not designed for beginners, but even if you are a beginner, you're going to at least want to see this book for examples of what to strive for! I was totally blown away by the beauty, complexity, and power of Sarah's art work. Ok, so let's just get this out there again so no one will be misled: to master projects like these will take a LOT of practice. This is not a book of easy afternoon or weekend projects. The two main focus points of Woven In Wire is dimension and symmetry: adding depth through sculpting and careful precision in design. But more about that later. Sarah starts off with a discussion of tools, and though you won't need an entire room-full of them like with some art forms, it's important to have excellent tools in order to go beyond beginner work, especially in your pliers and hammers. For materials, Sarah prefers pure silver and copper round wire in dead soft, though she lists and compares other wires as well. On to techniques. There is a detailed discussion on weaving properly by hand, including the all-important hand position in order to not end up damaging yourself over the long haul. Sarah covers straightening wire, creating various basic shapes, hammering, creating points, filing, torching, adding beads, patina, and polishing. Then she covers, in great detail, the three basic weaving styles that she uses for most of her pieces: figure 8, modified soumak, and the lashing weave. Following the basics (which are basic, but not simple! ), Sarah turns to the projects. The first chapter of projects teach sculpting the wirework by hand or by tools. There are two pairs of earrings, a ring, a clasp, and two bracelets in this chapter. 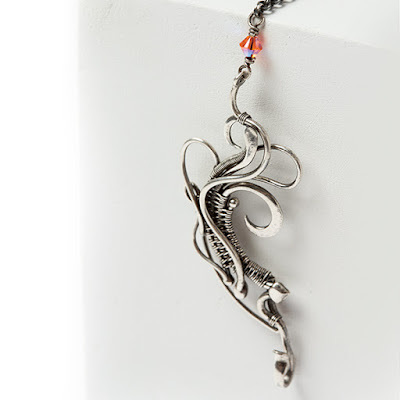 My favorite is the clasp called Tempest, which is shown above. Gorgeous, huh? I would never wear that clasp in the back, I can tell you that! The next chapter has 5 projects and focuses on mastering symmetry. There are 3 pendants, a pair of earrings, and a bracelet. The last chapter has 2 super-challenging projects that combine some of the previous components in complex and layered ways. Just in case you thought you'd mastered it all, you now find out that there is an entire world of exploration yet to go! And isn't that what you want in a technique book? To be able to go beyond just what's inside of it?